Submission for the Tarot Blog Hop “Wish Upon A Star”. It’s time to review, release, renew and reveal. The day of winter solstice, December 21st, is the perfect time to rest and reflect on the year, and to recognize that as the days become lighter you too can become lighter, if you set the intention to make it so. You worked hard this year and had some clear success coupled with some challenges and it tested your patience and strengthened your resolve. Winter solstice is an opportunity for you to shine a light on your success and to amplify the magic behind those stories. Winter solstice is also an opportunity to shine a light on some of the challenging aspects of your story and to release what didn’t work. When you release the challenging aspects of your story you make room for more of what you do want. It’s time to embrace the light of winter solstice with intention and personal power. Was it a good year? When were you happy and joyful? Who encouraged you throughout the year? What did you create? How were you successful? Alternatively, how were you challenged? What was frustrating about this year? When did you feel blocked by yourself or others? When did you work really hard and not see the results you wanted? What did not work out? Now is the time to put our dreams and wishes into the winter wind and anticipate they will be carried forward into the warmer months. Many of us are ready to let a little more light and magic into our lives. Our intention can allow this to happen. Ask for what you want now and know as the ground becomes warmer and more light enters the sky you will be able to see the result of your wishes. Ask the universe to help you with some of your dreams but also commit to working hard on making some of your wishes a reality in the new year through your own effort. What part of your life experience was in shadow this year? Define your own shadow and the shadow you were confronted with in others. Write it down. Who or what tried to diminish your sparkle? What aspect of the shadow needs to be released? Shine a light on it and release it with light. Light a white candle that will honor what is dark within yourself and others. Take your tarot deck and divide into the three separate parts: Major Arcana, Minor Arcana and Court Cards. 1. Using only major arcana cards, shuffle and choose one card to represent the shadow lesson from 2017. What aspects of the shadow lesson were out of your control? What did you have control over? In 2017, your shadow self was interested in living a carefree existence. The Fool is innocence and light-hearted and the presence of this card suggests your choices in life were made from a positive place (even in darkness!). Since your shadow self was led by the light of day (the sun) many of your mistakes were excused because you were perceived as innocent, positive, and enthusiastic. This year, you were willing to take risks and meet new people and your shadow self put you in the position to explore. You made choices based on what seemed interesting and you were led in many new directions. Some choices led you to dark people and places, but you still had the brightest and sunniest disposition in the room. You didn’t have any expectations about what the new direction should look like or what the people around you should be like and this made you seem flexible and likable. Because you were putting so much of your own energy out there (and not expecting any in return) you may have felt tired. The shadow self kept the candle burning at both ends even when you should have been sleeping. In 2017, your shadow self was a perpetual student. You did not seek to become a master or authority. You learned from everyone around you and let life experiences teach you. This may have frustrated some people around you as they wanted you to step up more into a role of leader. Some judgement may have been placed on you because other people may have wanted to see you act a certain way, organize or plan something on your own (and see it through), or to prioritize work over the adventure. This year, your shadow self felt restricted by any formality that was placed on you and you would act out if others tried to push you in a direction that didn’t allow enough freedom or flexibility. 2. Using only minor arcana separate the suits into cups, coins, swords and wands. You will have four stacks of cards with 10 cards each. Shuffle each stack and draw a card to see where you were challenged this year. Where were you challenged emotionally, creatively or spiritually? What did your shadow self need from the physical world? What did your shadow self do with the energy your were provided? How did your mind interpret and react to how your shadow self used opportunities? If you would like to choose a candle that relates to an area you would like to add more light to and release, use your intuition to do it. In 2017, you were given new opportunities to make money and to prove your ability in the world using your own talents. The shadow aspect of your spirit sometimes interpreted these new opportunities as frustrating because the extra effort to create something from the ground up made you feel drained on an emotional and energetic level. It’s important to note, with the presence of the Fool representing your shadow self for the year, your Crown Chakra may have been flooded with spiritual or energetic information that was not meant for you. Because you were coming from a place of innocence you were left unguarded and the people you met along the way might have tapped into to your positive and light-hearted energy flow, sometimes with and without your permission. Because you were social and always on the go, you noticed the drain but didn’t try to stop and heal yourself or protect yourself until your body forced you to slow down and heal later in the year. You were reminded that grounding, clearing and shielding are important steps to take when you interact with other people. Your shadow self may have been hard on you this year, as you felt pressure from others to complete tasks you became frustrated and resistant to completing the work. The shadow aspect of your spirit made choices from a place of doing things in your own way. You wanted to provide for yourself using your own gifts and talents. There may have been a past life connection that was assisting you with stabilizing your path and commitment to being an entrepreneur but because you were channeling so much on an emotional and energetic level you became tired and needed to slow down and rest part way through the year. You were not able to fully realize the gift from the spiritual companion. 3. Using only court cards, shuffle and choose one card to represent how people saw your shadow and one to represent the shadow you saw in other people. In 2017, you said yes a lot, but were not always able to complete the mission of what you said yes too. Part of your work was to organize the details and since you were in a more carefree place (with the Fool) you were not able to plan or organize as effectively. Coins typically represented people who crave safety and security, and they want to do a good job, but sometimes your shadow made you feel unsafe and sometimes insecure (like what you were doing was somehow not enough). When you took a risk and put yourself out there sometimes you felt like the work was not quite what you wanted, but you pushed on because learning this about yourself was just part of the adventure. There were times when you needed to be alone but you said yes to being around other people. In 2017, the shadow you saw in other people sometimes felt ungrounded. You interacted with some people who believed what they were saying was coming from the heart but it translated as not being tangible or concrete. Your shadow self wanted nothing to do with it because it felt out of touch. Your practical shadow had no patience for flighty, open-ended, or self-absorbed people or interactions. Transparency was a must. What part of your life experience was in light this year? Define your success story. Write it down. When did you bring positivity, joy, laughter and abundance to others and when did you receive these qualities from others? What joy will you bring with you? Shine a light on it and amplify the magic. Light a white candle that will honor what is light within yourself and others. You will want to bring this with you in 2018. 1. Using only major arcana cards, shuffle and choose one card to represent the assistance you received this year. Who or what was helping you? What light was illuminating your story and how did this light guide the way for others? In 2017, the light of the moon was illuminating your success story (so, what was positive about the year was in partial darkness and guided by mystery!). Your magic was your own and it came in waves. There was also some confusion and secrets to navigate but the moon counseled you to take a solo path and to mind your own business when it came to working with others and being aware of their secrets. You focused on your own unique voice and expressed yourself in the way you saw fit. You saw a lot of beauty in the darkness and since you were not scared of the darkness itself, others felt comfortable and safe sharing dark aspects of themselves with you. Others shared because you did not judge them and they could see the light you were sharing was making them feel lighter even if it was the subtle light of the moon that was illuminating them. Your best moments were when you identified and understood the shadow in yourself and others but didn’t judge it. You were at your best when you minded your own business and intuitively you felt your way along, guided by a force you couldn’t see. You were in it alone. You were in a special magical place but it was all new and it was all different. You also noticed this element in others. This year, there was a huge spot light placed on the unusual: creative people, spiritual people, witchy people, counter culture people and you were thinking about where you fit in with all these different groups (because you fit into more than one). Sometimes this spot light reminded you that others are in the dark too, and the path forward is a solo journey for everyone. It’s best not to compare your experience with other people’s experience because it simply isn’t the same path. 2. Using only minor arcana separate each suit into cups, coins, swords and wands. You will have four stacks of cards with 10 cards each. Shuffle each stack and draw a card to see where the light of perception was shining this year. Where was the light being shined emotionally? What did you become aware of within yourself and others? Where was the light being shined on a physical level? Who did you support and how were you supported? Where was the light being shined energetically? Where did you direct your energy this year and how was it received? How did your mind react to what the light revealed? Choose and candle that corresponds with your greatest blessing. Say thank you to the universe and ask for more of the same. In 2017, there were many illuminations. You spent the beginning of the year really identifying with people who are less fortunate. You aligned your values with people who needed the most help. You listed to people’s grief and counseled and part of that grief became your own that you needed to heal within yourself. You have experience with and need to learning from the Root Chakra by rebuilding it. You counseled and supported others a lot this year and sometimes your services were undervalued. You became very aware of your need to plan out the details and to make more from your services knowing there is a balance and there are affordable services available for people who need them and higher end services available for people who can afford them. In 2017, you might have had intuitive or emotional gifts that were offered but you became aware of how much pruning and organization would have to occur before you were able to accept them. Part of what was being illuminated was the desire to cut away what no longer worked in order to accept what did work. You felt the desire to get your house in order so you were able to handle a fuller load. You also became aware of empty promises and people who control by offering incentives but were aware when they did not not deliver on their promises. During the year you may have also become very aware of unethical or unjust behavior. You were one to illuminate the experience of anyone who was behaving in a sneaky or underhanded way. Sometimes people were not happy with you casting a spotlight on their inappropriate behavior and wanted to punish you for drawing attention to it when they were trying to be secretive, but they couldn’t say you were wrong. This year, someone might have promised you something they were not able to deliver on and when it was taken away it was perceived as a betrayal. You aligned your purpose with a great leader, but in the end this person wanted to take something very significant from you that would have left you without the support you needed (especially financially). This was a great year for friendship and networking. You recognize you would not be where you are without the support of friends or colleagues. You also put yourself behind a powerful person who stepped up into their own position of personal power. 3. Using only court cards, shuffle and choose one card to represent yourself and one card to represent who helped you this year. In 2017, people perceived you as someone who makes heart-centered choices because you did what you felt was right and were led in the direction of your heart. You wore your spiritual nature on your sleeve. The part of yourself that cares about beauty, love and the intuitive was illuminated with light and you shared that lightness with others and it was received. You were guided by intuitive impulses and the messages were received by someone in a position of power. This person wanted to see how you would use your intuitive or creative gifts over the next year. Maybe this person was your boss, or another individual who was waiting to see results from you. Your intuitive and creative work work came from the heart. Your spirit led you to where you needed to go. Take two jars with the idea that one jar represents the shadow story and one jar represents the success story. Write down one challenge and one success and place one in each of the jars. In the shadow jar: Thank the universe for shining a light on this aspect of the shadow but let the universe know you’ve learned from this experience and you would like to release it into the world. You can use fire to burn it, water to drown it or put it on ice to freeze it, use wind (or your breath) to blow it away, or you can bury it beneath the earth (depending on the nature of what needs to be released). You decide. In the success jar: Thank the universe for the gifts that were provided this year and how you chose to use what was illuminated in light. Where did you shine? You want more of that success and light. You will burn the paper to raise the energy and amplify the magic. What are your dreams and wishes for the new year? What will the universe provide? What dreams and wishes require hard work? Who will help you with your dreams? On a piece of paper list at least 3 wishes for the new year. Set your intentions. Ask the universe to help you with one of your wishes and agree to accept responsibility for manifesting the other two in return. Using the entire tarot deck, shuffle and choose a card for each of your wishes that will shine a light on how to manifest it 2018. Light a white candle to symbolize the purity of your intention and ask the universe to help you manifest your wishes. Put the written wishes in the success jar and set them on fire to be released out into the world and into the new year. In the new year you might struggle with finding a voice for the right audience. Networking will be very important to you and you will feel vital and energetic. Other people will perceive you as outgoing and friendly. You will have a can-do attitude. At some point in the year you might feel frustrated with all that you are balancing, especially as it relates to other people. Communication with another person might feel frustrating as you try to explain how you juggle your obligations (work and school, work and parenthood, work and relationships, work and creativity). You also might struggle or feel a sense of conflict with your own mother or a creative person in your life. Part of the lesson might be teaching yourself or others to nurture themselves and to not give so much energy away. At some point in the year, it might be necessary to seek counsel from someone else. The counselor might need to be counseled. It’s important to be patient with yourself and the process. Do what you can to compromise with other people, focus on being playful, creative and nurturing with other people and take your time. There might be an exceptional counselor in your environment who is willing to listen to your anger or frustration about a particular person or situation. The advice is to be patient, to listen, and to reflect. In 2018, you will continue to learn from a significant relationship or experience. Socially, you want community, you want to be around people who “get you”. Finding your people is sometimes an undertaking, especially if you notice your family of origin doesn’t create the type of community you crave. But you know what? You can attract the community you need. Be open, lead with your heart, but remember to create boundaries where appropriate. You only have so much energy to share with other people in this world, so make your choices wisely. Let go of toxic relationships, take responsibility for how you have used your emotional opportunities. By taking stock and being honest, what’s the worst that can happen? You might choose to “work it out” with the people you are in conflict with, but be prepared to let go of some control. Handle your own piece of the emotional puzzle and allow others to handle their piece. It’s ok to walk away from conflict; work with your strengths. You can’t control the actions of others but you can control your own. On an emotional level, who are you responsible for? Who do you need to establish emotional boundaries with? By addressing your fears about the relationship, how does it empower you to make choices that are right for you? How can you take a step back and deal with your part of the relationship? You will find a solution by handling the details of your own life. If someone doesn’t “get you” or your method, it’s on them. You’ve decided to walk away from the heat. If you are interested in exploring the juicy details of your life, come and find me! 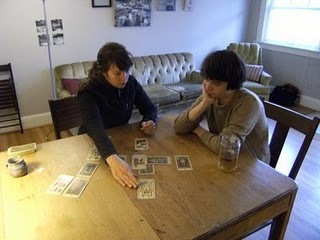 I have an new tarot residency on Nob Hill in Portland, Oregon. That means you get a bit of discount for getting a reading in an awesome public space. 15-minute readings for $20 and 30-minute readings for $40. I will be at What’s Upstairs, from 6 till 9 on Thursday, September 11th.